THE CHESS TOURNAMENT RESULTS ARE IN!!! WINNERS OF THE 4TH GRADE CHESS TOURNAMENT! SPECIAL THANKS TO CHARLES THORPE AND HEIDE BUNDY FOR THEIR TIME AND EFFORT IN ARRANGING THE CHESS TOURNAMENT EACH YEAR. WE WILL MISS YOU MRS. BEAMAN- YOU INSPIRED US! MRS. BEAMAN TEACHING MRS. BRADFORD'S CLASS HOW TO WRITE POEMS. WE WILL MISS YOU, MRS. BEAMAN. Logan McGraw, in Mrs. Bradford's class, is very lucky. His grandmother, Mrs. Beaman, is a professional poet. She visited Mrs. Bradford's class a few times throughout the school year, and taught the students how to add voice and make better word choices when writing their poems. The students love having her visit, because she is such a kind, sweet-spirited individual. When she visits the classroom, she makes the students feel happier and ten feet taller. Mrs. Beaman passed away on April 5, 2011. Mrs. Bradford's class wants to let Mrs. Beaman's family know how much they appreciated her help in our classroom. We will not forget the influence she had on us and our poetry. Our sympathy goes out to the family of Logan McGraw. WOW- A PROFESSIONAL AUTHOR COMES TO RIVERVIEW!!! YEP, THAT'S RIGHT- ABBY HARDMAN, IN MRS. BRADFORD'S CLASS, IS THE DAUGHTER OF A PROFESSIONAL AUTHOR!!! Mrs. Hardman came to the 4th grade and taught the 4th graders some "tricks of the trade". The 4th grade students learned a lot about getting stories started and having a good time doing it- thanks to Mrs. Hardman. Even the teachers learned from Mrs. Hardman. We would like to thank Mrs. Hardman for taking time out of her busy schedule to come out to Riverview and help us practice our writing skills. Thank you so much! Students taking notes while author, Mrs. Hardman gives some great writing tips! That's "write", a professional author came to Riverview Elementary- to teach the students how to write stories and have more fun while doing it! Mrs. Hardman, the mother of Abby Hardman in Mrs. Bradford's class, came to teach the students how to get ideas to begin their stories. For many students, getting ideas to begin their stories is the HARDEST part of writing a story. Mrs. Hardman helped the students with many wonderful ideas to begin their stories. The students loved her ideas and have found their stories have been much easier to begin, since Mrs. Hardman came and taught them some "tricks" about how to get started. Thank you, Mrs. Hardman, for coming to Riverview and sharing your talent with us. Mrs. Hardman has found pleasure in writing all of her life. She finds it both relaxing and exciting. She spent almost 15 years researching her first book, which is titled, Against the Giant. Mrs. Hardman has also published a second book titled, Santa's Secret. You can buy her books at bookstores or on-line. Logan McGraw pictured having a "ball" at school. 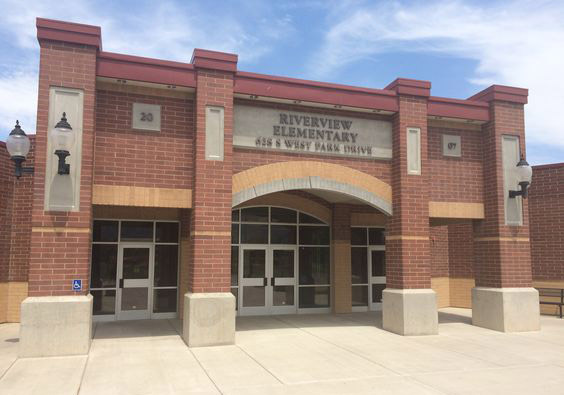 Let the good times "roll" at Riverview Elementary School! 4th grade students were very lucky to have Mr. Harold Scoble come to Riverview Elementary. He is the great grandfather of Madison Welling, a 5th grade student at this great school. Mr. Scoble displayed hundreds of his rocks and minerals, for the 4th graders to admire, as he talked about them and the history behind them. Some of his rock collection included; alabaster, shale, obsidian, marble, fools gold, petrified dinosaur bone and even petrified dinosaur skin!!! Students were absolutely enthralled. After Mr. Scoble's presentation, he gave each of our 108 students a sack filled with two kinds of beautiful prescious rocks. The students and teachers were very grateful for all of his hard work. He cut rocks for hours and hours, three weeks prior to coming to our school, so he could show the students the inside, or middle, of some of his beautiful rocks. Mr. Scoble has rock sculptures in New York City. He is a very talented individual. The 4th grade would like to thank him for coming to our school. The 4th grade would also like to thank Maddi Welling and her mother, Molly Welling for helping to arrange everything. It took a lot of time and effort on behalf of the Welling family to bring this display to our school. Thank you so much!!! 4th Graders Look at BEAUTIFUL Rocks and Minerals that Harold Scoble Brought to Riverview for students to Enjoy. 4th Graders have never seen such a large, beautiful collection of rocks and minerals such as the one Harold Scoble brought to Riverview. WHAT A CUTE LITTLE PRINCESS FROM THE 4-H "PRINCESS CLUB!" WHAT A CUTE, LITTLE PRINCESS!!! This is Hannah McDonald, and she is darling! She is giving us her best curtsy......showing off some of her "princess" skills that she is learning from the 4-H "Princess Club." Kelly Albrecht, 4-H teacher, turns students into princesses in the "Princess Club." Thanks to Kelly Albrecht (princess advisor), many cute girls at Riverview, have turned into little princesses in the after hours 4-H "Princess Club."